Over the Memorial Weekend, my daughter’s club soccer team participated in an invitational tournament. Several of the games were quite competitive. In the first game, we won, my daughter scored 2 goals and was awarded player of the game. It was exciting to watch and I was very proud. She scored another two goals in the second game. Later, I listened to my daughter, who is in 9th grade, and her team mate share their stories of being high school soccer players. The teammate shared her disappointment that she had not scored any goals since entering high school. My daughter then responded to her that she should just go ahead and score in the next day’s game and they pretended to visualize the score. I had been spending a lot of time lately sharing the importance of visualizing success with my daughter so I was very excited to hear her sharing that learning with her friend. The next day, Alexis’ team mate scored her first goal with an amazing shot. It was the only goal of the game and was the reason we made it to the tournament finals. Later they talked about how Alexis had just told her to go and do it so she did. I have spent a lot of time the past years watching my children play soccer, basketball or other sporting activities, as well as performing on stage. I have truly enjoyed watching them through their joys and disappointments. There is a quote that I remind myself and them to think of when they (or I) are faced with a challenge: “All things are possible to he (or she) who believes”. WOW NOW is more than a visualization of your goals and dreams. It is how you perceive your ultimate vision through all of your senses in the most vivid way possible. It is more than a goal, more than a dream. It is the ultimate desire for your lifetime success or legacy. I am another day closer to my WOW NOW. 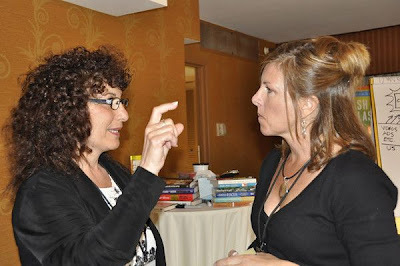 Visit www.impactlearninginc.com to see all I am up to as I attempt to achieve my WOW NOW. As a result of attending the Cash In A Flash Meeting, I have changed my entire business model. I have incorporated multiple streams of income into my business model as well as changed form a linear-only stream to the inclusion of residual streams as well. 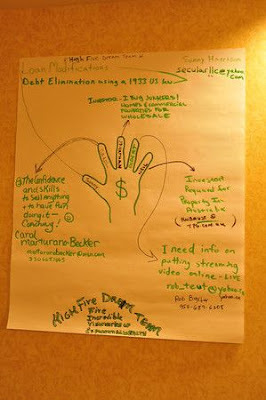 A key learning from the meeting was that I needed to work from a perspective of abundance instead of one of scarcity. This has changed my approach with the setting and executing business goals. My goals are loftier and my execution is more comprehensive and creative. I am energized with a very detailed vision of what my success will look like and what the impact will be on the legacy that I will leave. I am more focused and driven than I have been in a very long time. Chapter 3 provided the formula for success: S= M+H+T. To be successful I have to engage my mind, my heart and my team. If I want to achieve my dream, I have to be sure my mind is on track – I have engaged all my senses and my intellect. I also must be sure my goal is aligned with my values and that I can feel in my heart that this goal will truly allow me to live my values and to leave the legacy that is so important to me. Finally, no great thing was ever accomplished by a single person. We all need other people to help us, support us along the way. Having a team of focused, determined and competent folks aligned and desiring to also achieve success will ensure my outcome. Chapter 2 of Cash in a Flash established the foundation for success. It must start with a “Wow Now” vision that I can clearly sense in every way and keep front of mind as a beacon of light directing me toward my dreams. Next is to listen to my “Inner Winner” and not let the naysayers steal my dream. I have always been very intuitive, yet I have not always listened to my intuition. Sometimes I have let others or my own insecurities lead me off track. In Chapter 2 I realized how important it will be for me to listen to what my inner self is saying and to keep on following it no matter what barriers others may present. If I believe, I can do. Chapter 2 also reminded of the importance of surrounding myself with a team of talented folks who can share the journey with me. Some of my best memories of success have an ongoing theme of working toward a shared vision with a “Dream Team”. The right side of the chapter demonstrated that there will be challenges along the way and that one must always pay attention, listen to others and act in accordance with my values, again always keeping my dream in the forefront. 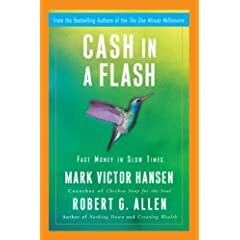 Chapter 1 of Cash in a Flash got me thinking about the goal of making money- quickly. I have always been more of a long term thinker/planner and less oriented toward planning for the very short term. Reading the first chapter made me realize that although I may be doing right things, I have not been doing them with a sense of urgency. Only with that sense of urgency and a change of approach can I be successful in the short term. To set up my “financial kitchen”, I need to use a recipe that will use quick techniques that also result in a delicious “meal”. I need to move quickly, but not be in such a rush that I do not follow the process. I don’t want to “rush the gumbo and spoil the roux”. Day 3 came and I was amazed at how far I had come. This has been the most impactful learning event I have had in 20 years. I am looking at myself, my talents, my goals and my plans all in a new way. I am energized in a way I have not felt in a long time. 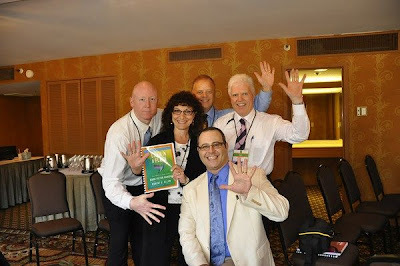 I love the High FIVE Dream Team and feel a real bond with my team mates- we will succeed. A part of me did not want the day to end, another part of me was soooo anxious to get back home and to get going. I hopped onto a red eye flying east and instead of sleeping on the plane, I found myself planning and organizing. I am renewed. I plan to completed revamp my consulting business, I am going to focus on the concept of abundance instead of scarcity. Most of my life I have been exposed to a thinking model that had scarcity as a foundation. I worked in the corporate world where everything was competitive and where there always seemed to be a max, a cap or a limit. Learning to start with the concept of abundance has changed how I look at everything and how I will manage my work and my life. I am leaving a changed person. One of the real highlights of Cash In A Flash was the creation of my Dream Team, consisting of Jonathan, Sonny, Neil and Rob. We all recognize that we are stronger together and can achieve more if we demonstrate true team work. As Team Leader, it will be important for me to ensure strong communications and to keep us aligned and focused. I will work with the other CIAF Team Leaders as well. Day 2 was amazing. I enjoyed all the speakers who met with us. I began to feel a bond with all the other Cash in a Flash folks and found that I wanted to get to know more of them. I really enjoyed learning more about social networking which will be invaluable to the way I will work in the future. I also was reminded how important it is to leverage talents and find work/projects that I enjoy. I was reminded of the importance of looking for my low hanging fruit if I really wanted to make Cash in a flash. For me this would mean focusing on what I already know and have a talent to do. I also learned that people will be interested in "buying" knowledge associated with what I am good at. Having multiple streams of income is key to long term success, but for cash in a flash, I need to focus on the low hanging fruit. When I first arrived at the meeting, I was expecting it to be the usual "training workshop".It took only a short time to realize that the day would be anything but typical. Mark and Bob were so engaging and so passionate, I could not believe how quickly the day passed. The highlight of the day was being placed with my Dream Team. It was immediate "Positive Chemistry" and a shared goal between us that would prove to be very powerful. I learned that I am ready to achieve my dreams and that I really can do it. Bob and Mark provided me with a new way of looking at myself, my talents and my path toward my dreams. I also learned that giving is the certain way to also receive. 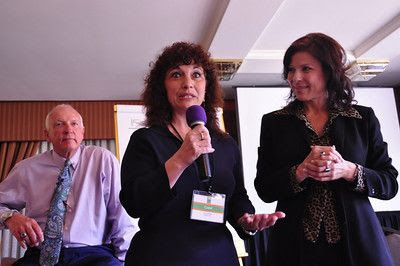 Before Cash in a Flash I was a traditional consultant working with large and small corporations, helping them to develop their leaders and their organizations, as well as to help them adapt to changing business conditions. My website was very linear- come and visit for information only. I considered it a place clients could come and learn about IMPACT Learning, Inc. It was not designed to be interactive or to sell products or services. With the downturn of the economy, many of my clients were finding it necessary to cut back on expenses. Funding for external consultants was greatly reduced. I became concerned that this year would be a tight year for my business. For a very long time, my husband and I have had dreams of financial freedom, having both the time and resources to better serve our community. We aspire to make a real difference in the lives of those who experience hunger and homelessness and also in the lives of women who have experienced abuse and need help so they can have a full and happy life. 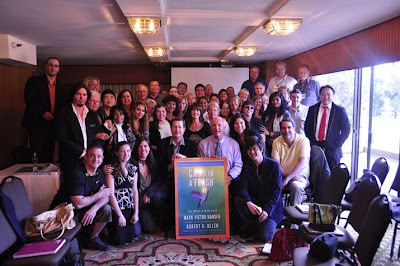 I joined the Enlightened Wealth Institute about 2 weeks prior to the CIAF meeting. I had heard Bob Allen speak and really bought into his message of multiple streams. I became committed to working toward the goal of being an enlightened multi-millionaire in a short period of time by expanding into new areas. 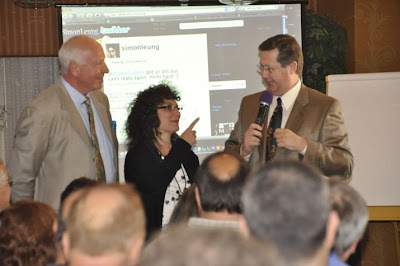 I had just started the learning process provided by EWI when I learned about the CIAF meeting. I love Mark's books. I felt that God had presented this opportunity in answer to prayer and I knew I had to be there. Before CIAF, I knew I had to make change, I just did not know what or how.